BK Strategic Group has partnered with Sutureout to bring to Ghana and the West Africa region their innovative suture removal tool- Sutureout®. BK Strategic Group is privileged to be the first and sole distributor of this product in West Africa. Sutureout has received great reviews from medical practitioners all over the world. It is easier to use than scissors, less traumatic to patients and more hygienic. 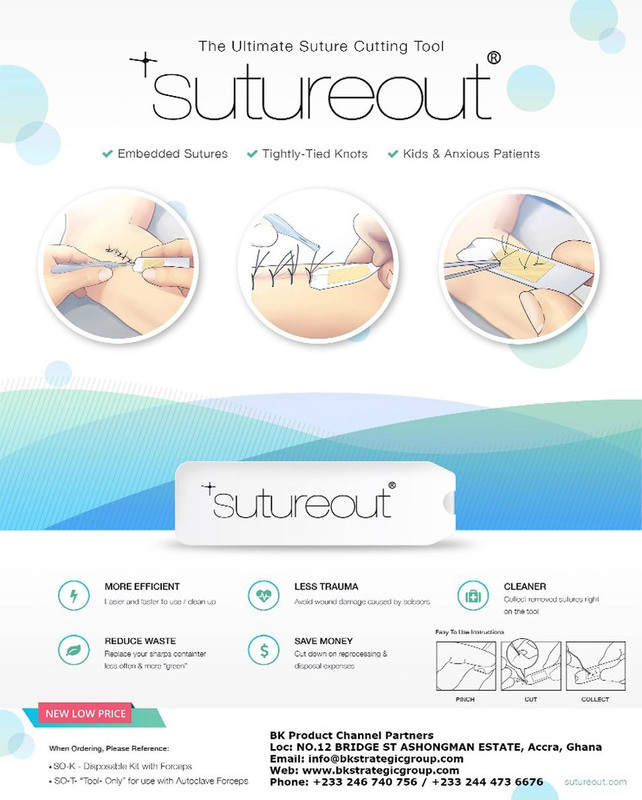 Sutureout is a sterile, disposable product that is intended for removing multiple stitches from a single patient. Sutureout “outside-in” cutting approach is quick, easy and super versatile – making removal of embedded and tightly tied suture loops way easier. Just press the cutting edge under the tied knot to sever the loop and remove the stitch. We offer discounts on high volume purchases. Public hospitals, Private clinics and Medical distributors, please contact us for a special pricing. Copyright 2019 © BK Strategic Group | All Rights Reserved.